I remember watching the televised Mary Martin version as a child; the first Broadway show my grandparents took me to see was the 1979 revival of the Broadway show. I watched those as a child and saw magic of Peter Pan as a child: the wonder, the adventure, the fear and avoidance of what growing up would mean. That Peter was played by a woman barely registered in terms of text or subtext. 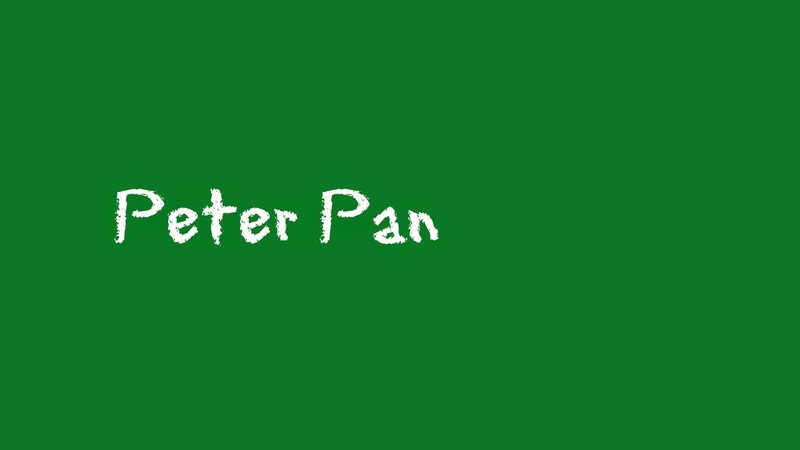 Growing older, growing up, meant learning more about Peter Pan and J.M. Barrie, the man who invented him. I'm not going to get into that -- there is plenty out there about it. While the origins, inspiration, and evolution of Peter Pan are fascinating right now I'm writing more about viewer response, and one viewer in particular: me. I love Peter Pan. Watching it as a child was magical. And I got it: Wendy and the boys went, had adventures, and when they had had enough, they went home. Hook (1991), which said that growing up doesn't mean losing touch with one's childhood. Traditionally, Peter Pan views growing up as either/or, with growing up a putting away and forgetting of "childish" things. Hook said that becoming an adult can be a good thing, but it doesn't mean a rejection and forgetting of childhood and that Peter doing so wasn't healthy. It was just as unhealthy as rejecting adulthood. Peter Pan (2003), which gave us an age-appropriate boy, Jeremy Sumpter (born 1989) playing Peter Pan. This meant that when Pan said he was a child who hadn't grown up, the viewer saw an actual child. The other children were also played by children of the right ages for the text; Rachel Hurd-Wood was born in 1990. It captured the magic of Peter, the desire for adventure, and kept it child-centered. It's practically perfect. As a lover of Once Upon a Time (TV series), I have to also mention their version of Peter Pan. Robbie Kay (born 1995) played Pan in 2013. Pan was played by an older teenager, and Kay clearly wasn't an adult but he also wasn't a child. This take -- spoilers -- was perhaps the darkest one yet, in which Peter Pan was not a child who refused to grow up but rather an adult who refused to remain a grown up. Once that adult was offered the chance to become a child again, he not only took it, he was willing to kill to stay a child. For this version, being a child was not about being "innocent" but was about refusing responsibility. As an adult, how I view Peter and Wendy is more complex. The recent TV version, NBC Peter Pan LIVE, got me thinking about Peter Pan and childhood and how we view that, and I'm not sure if they intended it to be that way. Except for the roles of Michael and John, all the actors were adults. Wendy, Peter, the Lost Boys: all grown ups. Seeing adults say the lines about being a child, pretending, not growing up, just made me really think about those lines and what was, or wasn't going in the play. As I think about it, I realize that the hero is, and always has been, Wendy -- it is Wendy who goes on the adventure to Neverland, it is Wendy who is faced with the conflict of her "let's pretend" being challenged by those around her as not good enough, it is Wendy who realizes that playing by someone else's rules gets tiring, and let's just all go home now, OK? It is Wendy who later realizes she cannot deny that same pretending to her own daughter, just because Wendy herself is older and wiser. Part of the problem is that it is Wendy's adventure in Peter's world. Emily Asher-Perrin has a brilliant analysis of Peter, and how Peter himself is hardly a hero, in Peter Pan's "Greatest Pretend" is Heroism at Tor. As she explains, "Here’s the thing about Neverland—it is Peter’s playhouse. He is like the guy who owns the casino; the house always wins and he is the house. Everything in Neverland is set up so that it caters directly to his whims." Most children, myself included, would not pick up on that because the whims of children can be so similar so it's not obvious to younger viewers that this is Peter's playhouse, not any child's playhouse. That it is Peter's playhouse, and all those his playthings, is part of the problem with Tiger Lily. Tiger Lily -- that's another area where much has been written. Two recent articles on that: at Why 'Fix' Tiger Lily? Why Not Just Let Her Go? by Dr. Adrienne Keene, posted at Indian Country; and #NotYourTigerLily: Nine Months Later and They Still Don't Get The Point by Johnnie Jae, posted at Native News. As Asher-Perrin concludes at her article at Tor, "as Barrie states, Pan will always come back to steal our runaways and lost boys, and will continue to do so as long as children are “Innocent and heartless.” The genius of Pan’s tale, is that innocence does not automatically denote goodness. Instead, it makes a child’s lack of experience a very frightening thing after all." These things happening to children, by children, as in the 2003 version, make sense. Peter played by a child has it make sense, even if the child has lived years and years as Peter has. As adults, we recognized that children are, well, children, and excuse or understand. Now, suddenly, have adults say those lines? Do that pretend? Refuse to grow up? The NBC version is no longer a brilliant and honest look at childhood and growing up; instead, it is a look at those adults who avoid growing up, even as they physically grow and mature, and it shows that this resistance to adulthood is not charming - it's creepy as hell. Holding onto childhood and avoiding responsibility or making decisions is neither innocence nor goodness. It's creepy. And that creepiness? Is why yes, I still love Peter Pan. Because it gives one thing to the child viewer and another to the adult viewer. Because it's willing to say that children and childhood aren't perfect; and are not something to idealize. Growing up is not a bad thing; refusing to do so, fighting against it, isn't a good thing. and you're awesome! thank you!